The new LTU30 series ultrasonic transducers, featuring very high efficiency narrow beams and wide frequency bandwidth, work in many conditions over wide temperature range. They are insensitive to mountings, and with help of the transceiver and smart signal processing, eliminate unwanted echoes from tank walls, standpipes and many other buildups. 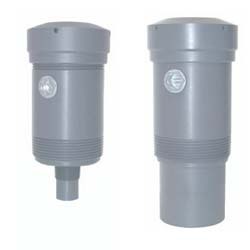 LTU series transducers provide a self-cleaning operation, so their faces eliminate almost any buildup and condensation. The ultrasonic probes adapt to most environmental conditions as their power and receiver sensitivity adjust automatically to any distance and reflecting object thus keeping the same echo amplitude over the operating range. LTU’s can be calibrated, in process or outside process, with simple push-button calibration. With built in communication with PC, it allows for simple calibration via PC and storage of the current output and temperature in a data logger. The data logger is linked with the Microsoft Excel. The ultrasonic probes can be connected in network using RS485 with Intempco’s protocol and Modbus RTU. In connection with a PC, one can have a full diagnostic (loss of echo, temperature sensor failure, noise error, etc.). A user can also see on the computer screen the echo profiles and echo stability chart. Through the communications, some parameters can be changed and also a set point and programmable calibrations can be done. Please call us at (800) 446-4316 or contact us here for more information on ultrasonic level transmitters, other level sensing equipment or for any other process variable control needs.